As the summer months moves in and the cooling season gets into full swing, you need to ensure that your Chicago home’s air conditioner is as efficient as possible. Your air conditioner is a huge part of your home’s energy efficiency during the summer months, and saving as much as possible on your cooling costs can drastically reduce your overall energy costs. An efficient air conditioner won’t need to work as hard to cool your home, so you’ll be able to keep your home more comfortable while spending less. There are many steps that you can take on your own to ensure the efficiency of your AC unit, and the professionals at Air Choice Heating and Cooling can also help you take steps to keep it as efficient as possible. Tuning up your air conditioner is the best way to make sure that it’s in the best condition possible at all time. 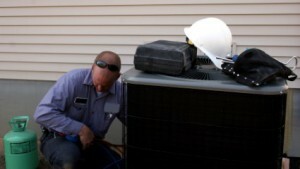 Our HVAC contractors recommend that you have a tune-up performed at least every year. During a tune-up, we’ll find any minor repairs that you may need and we’ll make sure the AC unit is as healthy as it can be. Tune-ups will ensure that your Chicago air conditioning system is performing at its best, and they’ll increase the lifespan of your AC. Appliances that create significant amounts of heat should only be used during the coolest parts of the day. Don’t cook with or use your dishwasher until the evening, and it will be much easier to keep your Chicago home cool. In rooms with appliances that produce heat, like your bathroom or kitchen, ventilation fans can help remove hot air from inside your home. This will take a lot of pressure off of your AC by keeping your home cooler. Ceiling fans can help your air conditioner circulate the cooled air that it produces, so you air conditioner won’t need to work as hard to maintain a cool temperature in your Chicago home. Placing booster fans next to vents can also help to keep your AC more efficient. Insulation is also extremely important to energy efficiency. You may notice that older windows need repairs or even replacement in order to be adequately sealed. If you’re looking for air conditioning repairs in Chicago, call Air Choice Heating and Cooling at 630-501-8027, or fill out our online request form.